10,853 people in the UK perished during the winter of 2017/18 as a result of living in a cold home. This shocking statistic comes from End Fuel Poverty Coalition member National Energy Action‘s (NEA) 2018 UK Fuel Poverty Monitor. You can download a copy of the report here. The Monitor is NEA and Energy Action Scotland‘s (EAS) annual investigative report into fuel poverty across the UK and within each of the four nations; England, Northern Ireland, Scotland and Wales. This year’s monitor focuses on the severe cold weather experienced in February and March of this year, referred to by the media as the ‘Beast from the East’. Between February 28th and March 3rd 2018, the UK was struck by some of the most severe winter weather experienced in almost a decade. Much of the country was swathed in snow and wind-chill temperatures plummeted the already freezing temperatures further. Health and social care services faced unprecedented pressures, roads were impassable, communities isolated and many households suffered power cuts. A short video presenting the UK’s experience of the ‘Beast from the East’ can be viewed here. The report identifies that the February and March cold snap resulted in an influx of demand on frontline services, with many seeing an increased number of households with more complex needs, seeking support. Many organisations were dependent on the goodwill of staff and volunteers but a lack of planning and resource meant many services creaked at the seams, leaving far too many households living in a cold home. The introduction of requirements, similar to those required of regulated energy suppliers and distribution companies under the Priority Services Register, and enhanced regulatory scrutiny for unregulated sectors such as Liquefied Petroleum Gas (LPG) and oil. Revisions to the Digital Economy Act to permit local authorities, public sector health bodies and energy network companies to data-match with the Department for Work and Pensions, autonomous from licensed energy suppliers. Ofgem, the regulator for gas and electricity markets, has announced details of a proposed price cap on energy tariffs. This will mean households covered by the cap will be protected from being charged more than they should for their energy, with suppliers being required to reduce prices either to the level of, or below the cap. It is expected that the cap will be in place by the end of the year. The price cap is expected to save consumers approximately £1 billion, with the exact savings a household may see dependent on their energy use, their current energy deal, how much they currently pay for their energy and whether they are duel customers. 11 million households on poor value default tariffs will be protected, whilst a typical consumer on the most expensive tariff is expected to save more than £120. Standard duel fuel energy consumers will have their tariff capped at £1,136, meaning customers will save an average of £75 each year. Ofgem’s press release is available here and you can read the full proposals here. A number of the End Fuel Poverty Coalition’s members issued statements in response to the price cap. You can read each members response by clicking on their name; Citizens Advice and National Energy Action. The End Fuel Poverty Coalition (EFPC) has written to Ofgem, the government regulator for electricity and gas markets in Great Britain, calling for the Safeguard Tariff to be preserved and extended. Under the Safeguard Tariff, customers on prepayment meters or in receipt of the Warm Home Discount (WHD) are safeguarded as to how much they pay for their energy. This means there is a price cap at which suppliers can charge customers for their gas and electricity. More information about the Safeguard Tariff is available here. Vulnerable customers are less likely to switch suppliers or tariffs. In 2016, the Competition and Markets Authority (CMA) reported that those on a low income, over the age of 65, on the Priority Services Register or with a disability are less likely to have switched supplier in the last 3 years. These consumers are therefore more likely to be on the highest tariffs and paying more than they should for their gas and electricity. The Coalition advocates that the current Safeguard Tariff is expanded and is very concerned it will be prematurely withdrawn. Currently the Tariff is only available for those households in receipt of the WHD, which is made up of 2 groups; the ‘Core Group’, which largely consists of poorer pensioners, and the ‘Broader Group’ consisting of a small number of households who apply. This means many households who are of working age, in the lowest income deciles and burdened by high living costs miss out on the vital support provided. Failure to extend and preserve the Safeguard Tariff could leave many low-income households exposed to increases in their energy bills, in turn creating anxiety over finances and leading to the adoption of unsafe coping mechanisms. You can read the Coalition’s letter to Dermot Nolan, Chief Executive of Ofgem, here. As the general election of 8th June approaches closer, the End Fuel Poverty Coalition makes five key recommendations to the parties, and to the government that is democratically elected. Millions of people cannot afford to heat and power their homes. Millions are suffering ill-health, stress and anxiety from unaffordable fuel bills, which in turn can lead to social isolation and reduced educational attainment. The End Fuel Poverty Coalition believes that everybody has the right to a warm, dry home that they can afford to heat and power. We call on the next Government to take action to end fuel poverty and thereby improve people’s health and quality of life, reduce the cost of living, create jobs and cut carbon emissions. 1. Improve the homes of all low income households to the energy standards of homes built today (Energy Performance Certificate (EPC) Band C) by 2025 and make this a central element of its programme to address the lack of affordable housing in this country. This will result in dramatic improvements in comfort, health and quality of life and energy bill affordability for occupants. 3. Require fuel companies to provide bill rebates for all low income consumers and stop companies charging unfair prices to consumers who pay by prepayment meter and who have not benefited from energy market competition. 4. Take immediate action to improve the standards of private rented homes. This requires tough regulation – and effective enforcement of regulation – to outlaw dangerously cold homes from 2018 onwards. This should form part of a wider programme to improve tenants’ rights and security of tenure. 5. Implement a cross-departmental Fuel Poverty Strategy to end fuel poverty that sets targets for all relevant Government departments. In particular, this should address joint action to tackle cold-related ill-health, employment and income policies to make sure people have sufficient income to afford energy and other essential services and devolving power and resources to local authorities so that they can play a central role in delivering the Strategy. The End Fuel Poverty Coalition’s recommendations can be downloaded here – Key recommendations to government May 2017. This Friday 17th February is Fuel Poverty Awareness Day, a nationally recognised day to promote the issue of fuel poverty and the importance of ensuring vulnerable people are warm in their homes. 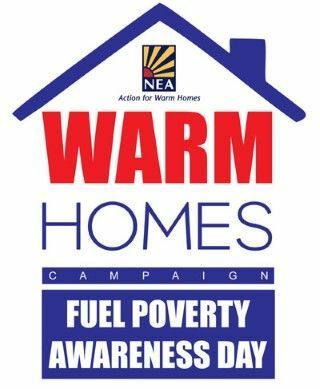 #FuelPovertyAwarenessDay is coordinated by our EFPC member, National Energy Action and intends to increase awareness of fuel poverty with a shocking 4.5 million UK households currently unable to live in a warm, dry home. Support the cause by signing up to the Thunderclap here and help ensure that #FuelPovertyAwarenessDay reaches over 1 million people. To coincide with #FuelPovertyAwarenessDay NEA is running The Nation’s Biggest Housewarming, many supporting organisations holding events, issuing messages of support, or holding bake sales. Find out how you and your organisation can get involved here. Keep your eyes peeled for a range of new resources released on the day, including a new Steps to Affordable Warmth video resource, which provides hints and tips on how to afford to stay warm and healthy at home, and is designed to be shared at community events, with clients or publicised online. Fuel Poverty Action, an EFPC member, are continuing to press for the abolition of extra charges for energy customers using prepayment meters. In October the Competition and Markets Authority (CMA) announced that it would impose a cap on costs for prepayment customers that would reduce bills by £75 a year. While a reduction is of course welcome, £75 is certainly not enough. Prepayment meter users pay on average £300 more than customers on direct debit and are usually the worst off customers. Fuel Poverty Action, in collaboration with a number of organisations, are campaigning for parity on energy costs, regardless of the method of payment. So back on 11th November FPA and friends took action and went to the CMA directly to hand in their response, held in in a tiny doll’s cap, to highlight the insult of the CMA’s insufficient proposal. Erika Lewis, for the CMA, agreed that the proposals are not set in stone and promised that they would take seriously the evidence provided. NEA’s Warm Homes Campaign aims to raise awareness of the importance of being able to live in a warm, comfortable home and illustrate how to improve access to equal life chances. This year, NEA is teaming up with I, Daniel Blake star Dave Johns who is backing the campaign. The campaign highlights that around four million UK households are still unable to access equal life chances because they live in a cold, damp home. These life chances are further compromised depending on the tenure of the home our baby will be born into. Find out more about the campaign here and its key asks here. Philip Hammond’s first Autumn Statement showed no mention of investment in energy saving and efficiency measures so desperately needed to lift 2.3m English homes out of fuel poverty this winter. The statement flies in the face of recommendations recently made by the Committee on Fuel Poverty, the government’s own advisory body, who call for a £20bn injection for its legally binding 2030 targets and 2020 and 2025 milestones to be met. While in today’s Autumn Statement the government held fast to its intentions to tackle inequality, spend more on the country’s infrastructure and intervene to address failing energy markets and high energy pricing, there was a glaring and obvious energy efficiency shaped hole in the measures outlined. A lack of investment in energy efficiency measures, such as a well-funded second Energy Company Obligation, is a huge missed opportunity for economic growth and poverty alleviation. The government must find £20bn if it is serious about meeting its legally binding fuel poverty target – that the energy standards of all fuel poor homes must be at least EPC C by 2030, the standard of homes built today. It is likely to miss its two interim milestones set out in its 2015 Fuel Poverty Strategy that is that by 2020 no fuel poor household should live in a dangerously cold home below EPC E and that by 2025 no fuel poor household should live in a cold home – below EPC D.
“Being able to live in a home that is warm over wintertime is a most basic need, currently unmet by 2.3 million families in England. The Autumn Statement was a prime opportunity for the government to prove its commitment to energy efficiency and in turn the alleviation of fuel poverty. However, the lack of mention of vital energy efficiency measures sadly nods towards its own legally binding energy efficiency targets being more rhetoric than reality.